malwarebytes seems to be blocking use of firstrowsports. If I disable it I immediately get ad popups. Edited by RandalSon, 29 December 2013 - 11:37 AM. This was the reason why it was removed at the first place. 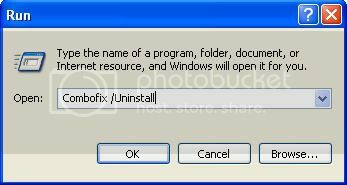 I don't really recommend you to install them because it will reintroduce the old problem back. I need you to make a batch file for your connection problem. Hopefully this will solve the intermittent disconnection. Double click on flush.bat & allow it to run. A small black screen may briefly flash on and off, that normal. Edited by Conspire, 30 December 2013 - 08:28 AM. Still won't copy/paste. Have unchecked the mypcbackup items. Have not clicked on Clean. scan did not take long at all. Edited by RandalSon, 30 December 2013 - 08:59 AM. Clean them this time. Attach the log when you're done. "flush.bat" has run. reboot was clean and browser open went to the right homepage. Good. Do observe the internet for any intermittent disconnection. Let me know after a couple of days. Goodmorning. OK, we'll see how things settle after a couple daily reboot cycles. Hey there - something, probably malwarebytes, took out the weather gadget again. I can live with that. No network issues. Good boot ups. I have 9 log files and all the apps except the one we uninstalled with shortcut icons on my desktop. What are we going to leave on, and what can I delete, and/or just delete the shortcuts? Ok we will do some housekeeping now. Do this first before removing any tools we used. If you see anything else that still lies around, do remove them by dragging to Recycle Bin. Edited by RandalSon, 03 January 2014 - 05:59 AM.